Orchids are a beloved plant for many gardeners because of their beautiful flowers. For some newbies, orchids can be intimidating because their care is different from other houseplants and flowers. If you received an orchid as a gift, impulse purchased one from the grocery or garden store, or have owned one for a few years, you may be considering repotting to a new container. Because of their special requirements, orchids need well-draining containers that can also support extra height when the plant flowers. For this article, we cover the best types of orchid pots and also give specific product recommendations for you to consider. Look for adequate drainage, with holes on the sides and bottom of the containers (4-12 per container). These holes also provide air flow for the roots. Select a pot that is only a little larger than the current pot. 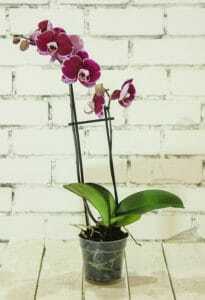 Orchids prefer smaller containers, and usually upgrading to 1″ wider pot is enough. The container should be strong enough to support your orchid when it’s in bloom. A heavy bottom or rigid sides are often good to support the orchids when they’re top heavy. Shorter orchid pots are better than tall pots. Orchid roots grow out instead of down and deeper pots tend to retain moisture. For orchid pots, most gardeners follow one of two philosophies: either selecting a decorative pot that provides enough drainage or using a double potting system. For double potting, the orchid itself is planted in a clear grower pot with many drainage holes or slits and that pot rests inside a decorative pot. The choice is up to your preference, but frequently when you purchase an orchid from the store, it will already be in a double potted system. If looks aren’t important to you, some people forgo the decorative pots altogether and just display their orchids in the grower pots so the roots can absorb sunlight the same way they do in nature. Beyond these options, you can also consider net pots, pots with bi-level drainage, and rot resistant wooden baskets. Check the next section for some of our recommendations. Generally, phalaenopsis orchids should be repotted every 1-2 years. Signs that it is time to repot your orchid include roots creeping significantly out of the pot and through the drainage holes or if the growing medium has started to break down. 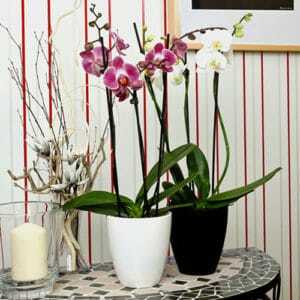 This is the most popular option for orchid pots because it’s affordable and provides everything an orchid needs. These plastic orchid pots are slotted with plenty of draining holes that allow for adequate airflow. Made from durable plastic, you can easily reuse these pots or even cut them apart to quickly repot your orchid next year. This design works great with orchid bark or moss. You can easily slip this pot inside of a decorative pot for a fancier look or just use it on its own. The plastic is thin, so there’s not a lot of weight to it. Some rocks in the bottom or using a heavier outside pot will help keep your orchids from tipping when they’re in bloom. If you’re looking for a decorative pot alternative to heavy ceramic pots, this is a great option from HD Printables. 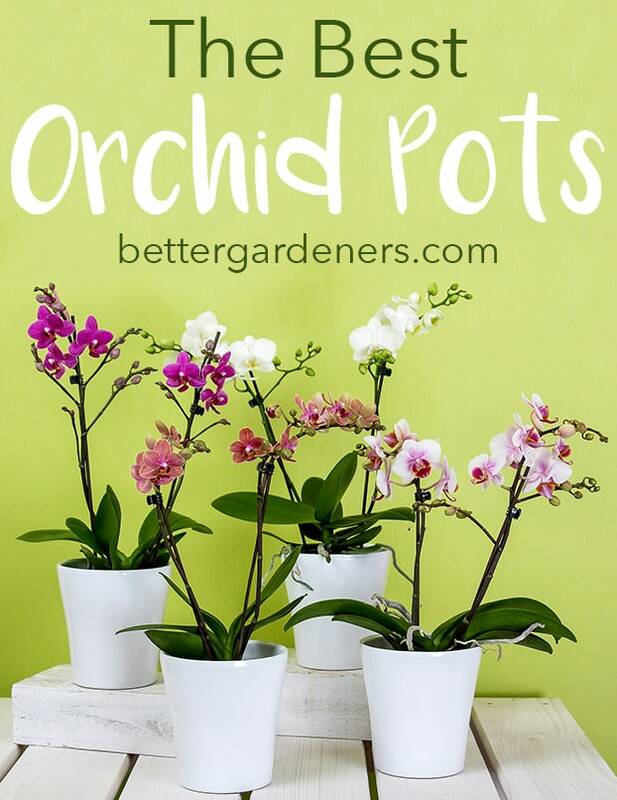 Made from affordable, non toxic plastic, this pots are made in the USA specifically for orchids. They’re designed with fashionable drainage holes that provide plenty of air flow for your orchid’s roots. Plastic pots are great for phalaenopsis orchids because it keeps the roots warmer than ceramic pots. Some notes on the design: it’s made for use with orchid bark, but these pots will work fine with moss as well. One of the downsides is that since these pots are made from lightweight plastic, they may tip over when your orchid is in bloom. We recommend adding some rocks to the bottom to give the pot a little extra weight. If you keep your orchid outside this vanda basket is an excellent choice. Made from cedar, this basket is hand crafted into an attractive octagonal sape, with metal loops installed to make hanging easy. The design provides great drainage and airflow for orchid roots. You can place the orchid in the basket alone or with sphagnum moss to hold in some of the moisture. If you want to use the basket with orchid bark, make sure to line the basket with coconut fiber or moss first. This basket is great for vanda orchids and phalaenopsis orchids as well. If you’re looking for affordable orchid pots that gift you a “best of both worlds” option, check out this pot from Mkono. It comes with an inner mesh liner that provides lots of drainage and air flow for your orchid’s roots. The liner fits perfectly in the white pot, which is a sleek and clean design that looks great in your home. The outer pot also has drainage holes in the bottom to prevent your orchid’s roots from getting soggy. The includes saucer collects any excess water. This design is great for use with orchid bark or sphagnum moss.